extensive author notes which reflect changes in technology and social culture. tarot professional at any stage of development beyond basic tarot reading proficiency. peppered with amusing anecdotes from the author’s career as a tarot reader. as your vision and mission statement. acceptance of tarot in the community at large. fulltime tarot professionals from many countries. Christiana Gaudet has been a tarot professional since 1993, and a student of metaphysics for much longer. From her office in Palm City, Florida, she serves a worldwide clientele with readings, instruction and mentorship. Christiana has been the resident psychic of fourteen radio stations, and has been featured on several television shows, including Inside Edition. A popular speaker at festivals and conferences, Tarosophy Tarot Association named her "Tarosophist of the Year" for 2016. Originally published in 2010, Fortune Stellar was her first book. If you have a Tarot deck you will end up reading for somebody, be it your girlfriend, your brother or your pet. Christiana Gaudet wrote a book that not only helps you to answer all the questions you come across while bringing Tarot to people but the book that is to be your true companion for as long as you use your Tarot deck (i.e, look up the first sentence=for as long as you, even occasionally, read for other people). To me, the most brilliant technique of the book is in exercises where you draw cards to answer questions about your Tarot business: be it about marketing or fees or mentoring you are going to provide, etc. The author shows you how to interpret them, and provides real life examples. Conducting the Code of Ethics is the part that I found to be the most timely for the current development of the image of Tarot in the eyes of the world community. It is not a secret that Tarot perceived in a hugely wronged way and there is just one solution: to prove the spiritual core of Tarot and integrity of its readers one client at a time. Developing your own Code of Ethics will help you develop your own set of guidelines, which support you in your element and provide the "safety net" we all need. This is not a book to read and go through exercises just once. I believe this is a true companion book for the length of your professional career as a Tarot reader or Teacher or a person who talks Tarot with others: doing the exercises on regular basics, once a year perhaps, will help you to discover new avenues of your business, ways to increase your Tarot income, nuances of your devotion to the Spirit and self, ways to connect with others and share the wisdom of the cards. 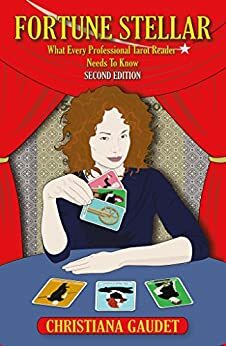 The lessons in this book are: Structuring your Tarot business; your professional Code of Ethics; structuring a professional reading; difficult clients, questions and cards; growing as a Tarot Reader; mentoring and teaching; appearances and performances; fostering acceptance in local communities. You will also find essays on Tarot art and history, practical exercises, meditations and 15 years of professional wisdom of the Certified Tarot Grandmaster Christiana Gaudet. I highly recommend this book to everybody who ever plans to give a reading to another person. I had been hoping for more of a nuts-and-bolts business guide. Maybe my expectations were off. I didn't really need advice on how to read the Tarot or spreads to use, but on dealing with legal issues, setting up business (she discusses this but in very general terms), etc. The other section of the book I was looking forward to-- dealing with difficult issues that come up with clients-- had some advice I downright disagreed with. I guess I feel this book tried to cover too much in a shotgun approach and ended up not covering anything very thoroughly. I do realize laws, etc differ from state to state so it's hard to give uniform advice. Maybe my expectations were off and that's a subject for another book: a state by state guide to legal issues around Tarot. 5.0 out of 5 starsGreat tips for public readings! Fabulous and fun! I got many great tips for offering readings at events. Christiana has a nice style of writing, making her sound like a friend who you're having coffee with who's ALSO able to give you tarot insights. There's a note of authenticity and experience here. I like what she passes along to all of her readers, to give them a well thought out foundational plan to start reading professionally. Actually this book would be good whether you are just beginning the path to reading, continuing it, or taking it up after an abscence. You can't help but feel a firm foundation under you after working through this material. I also feel it helps a person clarify if and why they want to pursue the goal of going professional. Christiana seems to have been paying attention to the right details all along, and caring about the quality of her work. She doesn't stress this, but you feel reading this book that one of the most important lessons is to become part of your own journey with the Tarot, and to love the work you do with it. It's like living the axiom, "what you send out comes back three-fold". A good effort, and quite a singular book on an aspect of reading not frequently addressed. If Tarot is your passion the information contained in this book will help you learn how to be successful as a part-time or full-time professional. In Christina Gaudet's easy to understand 8 lessons you will gain the knowledge necessary to make this possible. Whether you are looking to just increase your knowledge, looking for some new ideas or trying to energize your existing practice you couldn't read a better book.